Hand-colored copper intaglio etching printed on hand-made paper. Each hand-pulled print is unique. Copper intaglio etching printed on hand-made paper. Each hand-pulled print is unique. 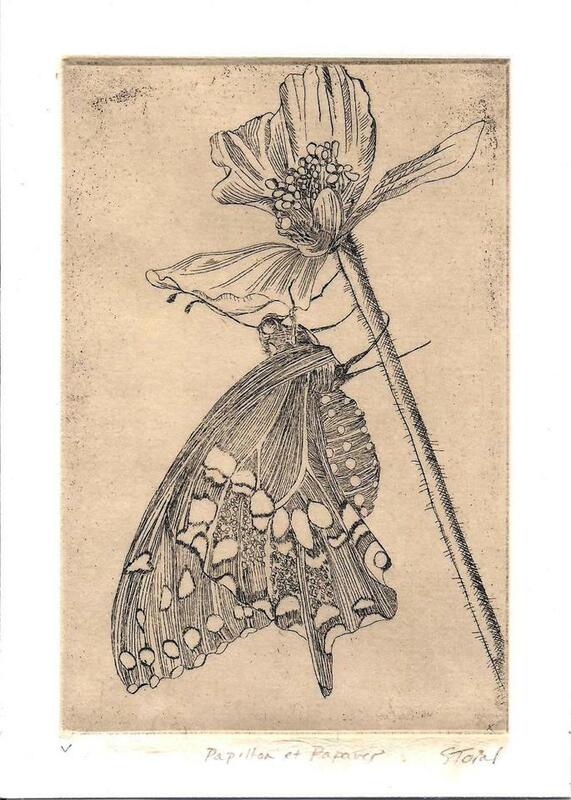 Intaglio Etching is a printmaking technique first introduced in Italy in the 15th century. Using a special stylus, a composition is drawn on a sheet of copper that has been treated with a wax-like 'ground.' The drawn lines expose the copper under the ground. Once the drawing is complete, the copper plate is placed in an acid bath. The acid 'bite' the lines of exposed copper and those lines hold the ink that will print the image when a sheet of paper is placed on top of the inked plate. The plate and paper are then run through a hand-turned press creating the final 'hand-pulled' print.